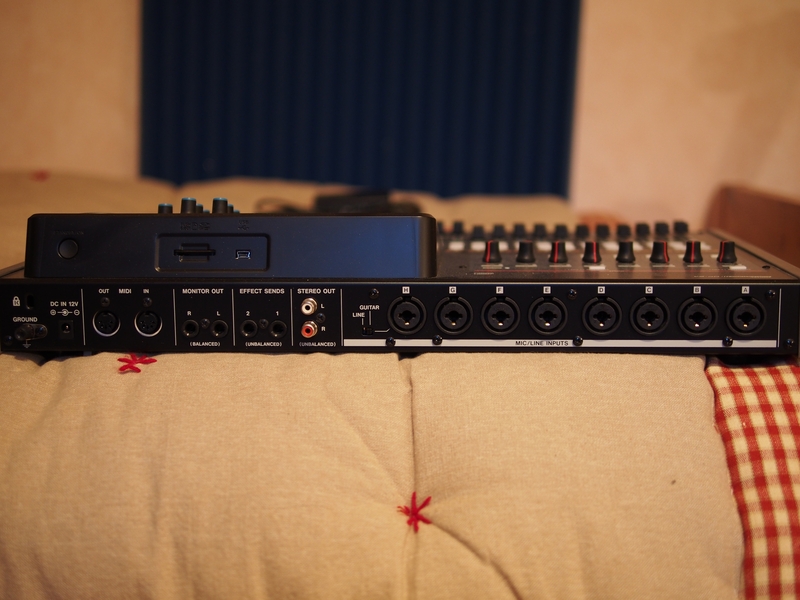 DP-24, Digital Multrack-studio from Tascam. 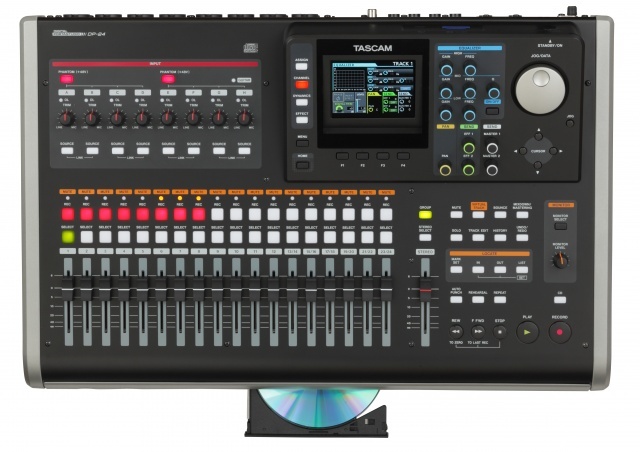 The TASCAM DP 24 is a digital studio with 24 tracks. It may seem like a larger unit, but it really is pretty small and compact which is the reason that I purchase it. Being that it was a 24 track studio that was portable was something that I thought highly off and wanted to have it right away. I also had a custom soft case made for it jus to protect it when it is not being used or transported. There is a semi large LCD screen on it that lets you look at the tracks like you would in a DAW on your computer. The screen is nowhere near as big as a computer screen but it is not bad considering the price of this unit and the size of it. There are only two mix down effects on this unit and they are reverb and chorus but they worked just fine for me. There is a built in CD drive that you can burn right to a CD from after you record a track, or you can use it for back up too. The DP 24 has a chromatic tuner and metronome built into it with MIDI input/output to sync your clocks with other gear. The total weight of this unit is no heavier than 15 pounds and it records and stores information on a SD card. It can take SD cards up to 32 GB. 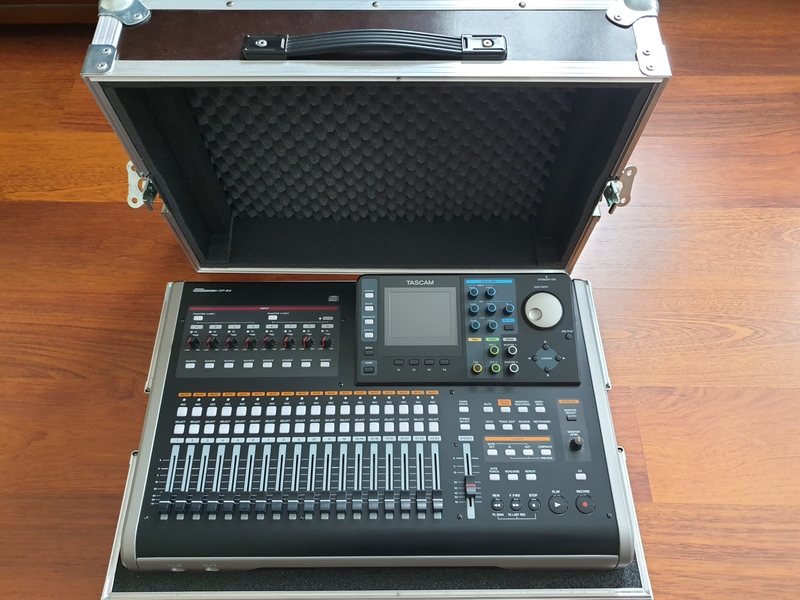 Just about everything you could ever need is on this portable studio, about the only thing that I was not a fan of what the effects section which is very thin. 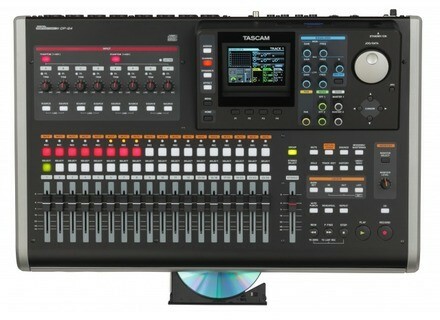 But you can also track out and use effects from other gear or in Pro Tools and where ever you do your final masters at. I mainly only use this studio just to do some small on the road stuff with but everything always makes its way back into Pro Tools for me, I love how I can just burn everything right a CD and later just put the CD in my computer to get my files. bennyevolve's review (This content has been automatically translated from French)" A good compromise"
Easy and well thought out .... for musicians like me who love ... not ordis. I used to make demos to save scores and keyboards wave and midi format (on CD) and then to mix in studio. (No need to register and stress in the studio). I Do it with me to cool. just going out with the mix cd. The manual is pretty clear and in several languages. The quality is quite good for its price / quality. I use since January 2488 2014.Satisfait former, my choice was pretty fast. 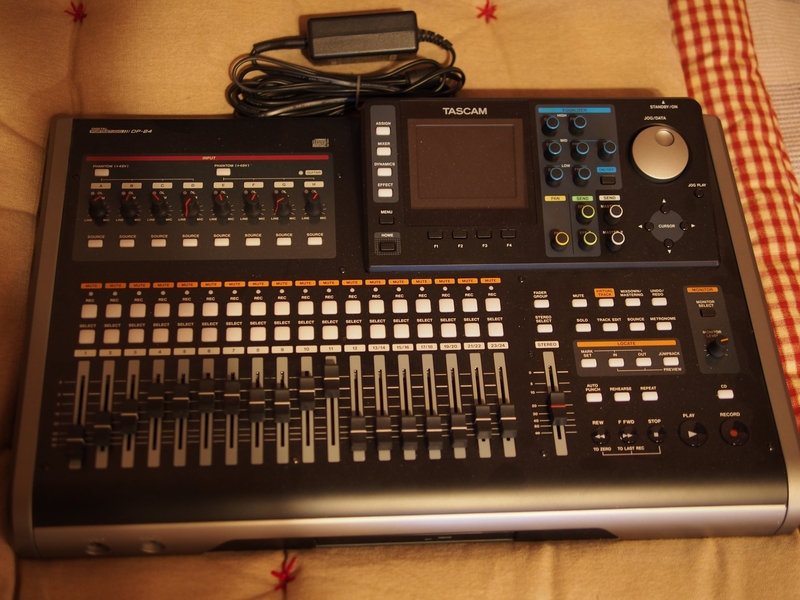 I even had a look about on zoom, korg, roland etc ... without enthusiasme. As I said before, the quality / price is quite correct. K-k's review (This content has been automatically translated from French)" Excellent this DP24"
The configuration is described in other reviews! the screen is for sure one of the highlights small but incredibly sharp! The manual is fairly detailed for basic functions but undoubtedly the DP24 is more than what is reported in the manual! 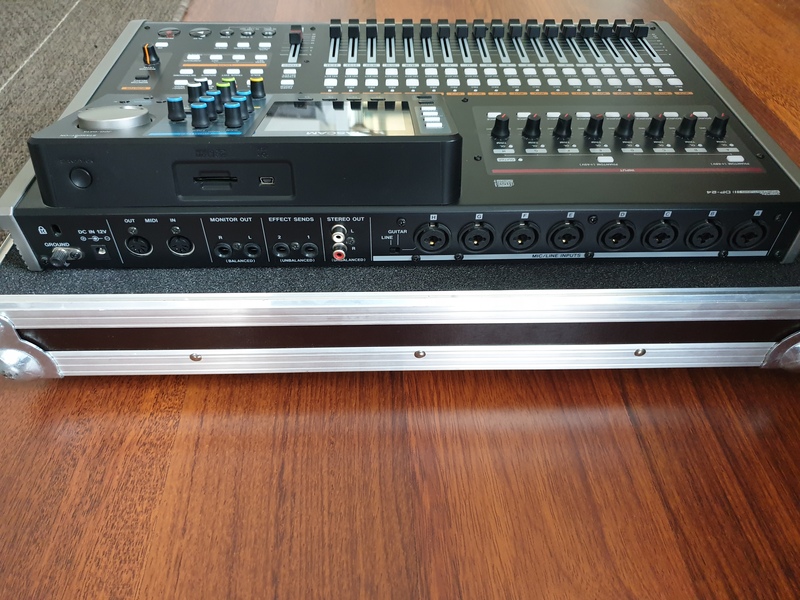 sound and recording level, I like everything is sharp and clear and the effects for someone like me who do not like abusing additions this and that and grind sound through here and there, are really great and I sort my music to the final with a sound much better than I hoped pouvai! I samba music raiz therefore quite clean and natural sonoritées and DP24 gives me satisfaction for just over 600 euros is really great! For sure I do it again the same choice and sometimes twice a day! You are a novice like me, then do not hesitate this bike holds, and what made this ad with a copy of its quality (if the sound upstream is worthy of the name) excellent after my ears and I always trust my esgourdes! And I have not been around all possibilities but 30mn watch in hand I managed to get a record 3 songs while this was my first experience in the genre, this is not nothing! 9/10 because there is always the size above 9 but it is not stolen! For the price and range of this equipment is really a bargain!